Beauty has been on my heart these past several months. Why is something beautiful? What meaning does beauty carry? 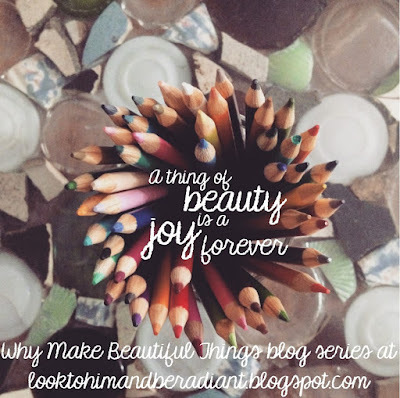 How do we bring beauty into the world as well as receive it? Especially as women, I feel that we yearn to bear beauty in our daily lives. I'm not talking about being an airbrushed model on the cover of a magazine, but more an attitude of the soul that radiates outward. That beauty manifests itself in characteristics like genuine kindness, empathy, and hospitality, but it also can be seen visually. We set tables with flowers, candles and our best china for a celebration. We take the time to put on a dress, lipstick, and fancy shoes. We use our skills to make and present the perfect gift for a friend. For Christians, beauty means something more. Its depth starts on the surface and goes far below to reach an understanding that is far beyond us. The beauty of virtue, the action of self-sacrifice, and the love of Another shows a greater truth. That beauty is evident in music and the written word, in cathedral spires reaching the clouds and paintings of the Gospel stories. I am not an artist. I do however feel the responsibility of creating a masterpiece with the life that God has given me, to both pursue and give beauty everyday. It can manifest itself in many ways, but it is becoming increasingly more important in a world where beauty, true beauty, is under attack. That quote is from JP2's Letter to Artists, which I encourage you to read. You also can watch this video tribute. Making something beautiful is an act of hospitality. In a home or place of work, taking the time to add art, to creatively arrange furniture, to create a place of rest can speak volumes to the people who are invited in. Regardless of square footage or simplicity, making a place beautiful shows that you value the people who are welcomed, that they matter, and that you are willing to take time for them. The nature of hospitality welcomes, and beauty welcomes as well. 2. Beauty brings joy in a world that often is dark. We are not fooling ourselves about the darkness of the world. Evil is present and has its clutches on society, on our souls. Beauty can speak the truth in small glimmers. It can show hope which draws us out of darkness and brings us into the fullness of joy. The presence of beauty can crack through even the hardest of hearts. I don't need words of a certain language or background knowledge or cultural experience to appreciate beauty. Paintings, sculptures, sonnets, stained glass windows, symphonies- we all can see and appreciate the beauty that comes from these creations. One step further takes us into beauty not created by human hands- that of the oceans and mountains, the sunsets and starry skies, flowers and smile of a child- this beauty is universally understood and universally known by all people. There are few things that are universal in this world, and beauty is one of them. 4. Beauty turns us outward. A desire for beauty, when genuine, cannot be about ourselves. Beauty is about someone else. Anything that we create and consider beautiful is wasted if not shared. A song is meant to be sung, a garden should be walked in, and a painting needs to be hung and admired. 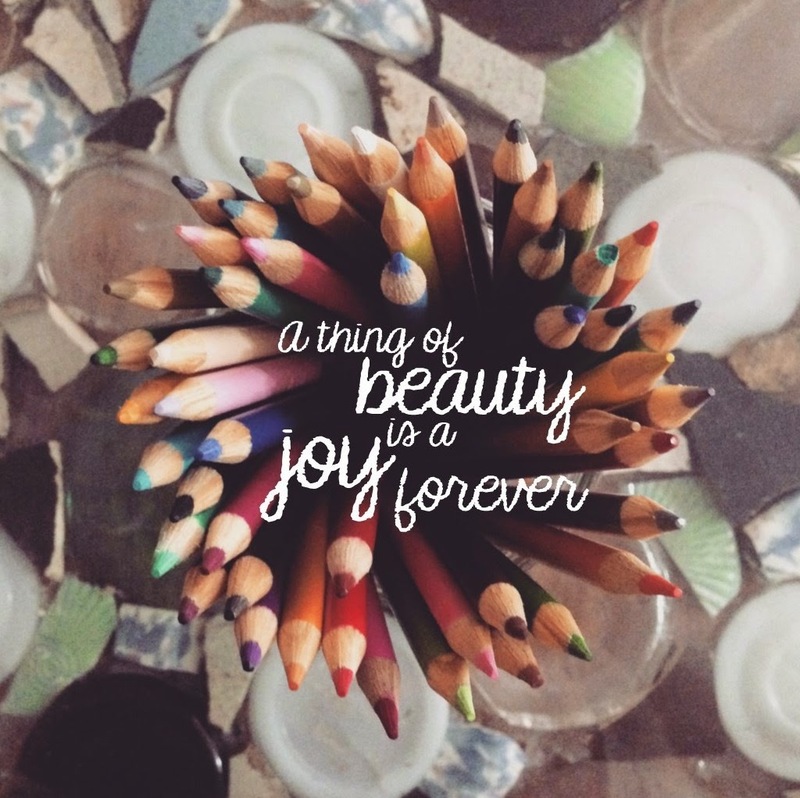 True beauty is meant to be shared, and that turns us outward, making us consider the lives and needs of others. 5. Beauty helps us understand mystery. When you try to create something, you first start with an idea in your mind. A perfect lattice crust pie, an intricate stone sculpture, a lovely photograph capturing a moment in time- all of these begin with a vision. However, if we are honest, anything we create falls short of that vision. Perfection is not to be reached here on earth. But that vision can be seen in the creation. There is a layer of mystery that goes beyond the physical when we look at something beautiful. That mystery, even if we can't articulate it, is embedded in our hearts and helps us know that we can't quite grasp all there is to have and to know. 6. Beauty points to Someone greater. True beauty is bigger than us. It is awe inspiring. It can make us feel small. The wonder that is produced through something beautiful is supposed to point us to Someone greater. If the minds of human architects can dream up and build a fantastic cathedral, how much more can the mind of God create? In the presence of beauty, our hearts open up, and our response should be to let God in. 7. Beauty is a taste of eternity. All the beautiful things of this earth tell me that beauty matters, and it matters because it teaches us about God. His plan for us is a beautiful one, a plan of love and redemption, of forgiveness and eternity. He wanted us to see a taste of this beauty here so that we would desire true Beauty forever. That Truth and Goodness and Beauty can only be found in Him. It is what we were created for. -On Monday, I'll have a post on the vintage clothing of my grandmother's that I have been wearing this spring. -On Wednesday, my sister Emily will be sharing thoughts on the beauty and hospitality that she has found in her two years as military wife. -On Friday, my sister Steph will have a post about why taking family photos (and printing them) is a beautiful way to honor your family. -AND on Sunday, I'll be hosting a special giveaway with seven beautiful items that I know you are going to love from Kayla Phillips Design, Steph Zimmerman Photography, and [un]common workbasket. You don't want to miss it! You have such beautiful insight. What a gift! And what a gift to discover this post. So glad I found this! So happy you're here, Mary Jo!